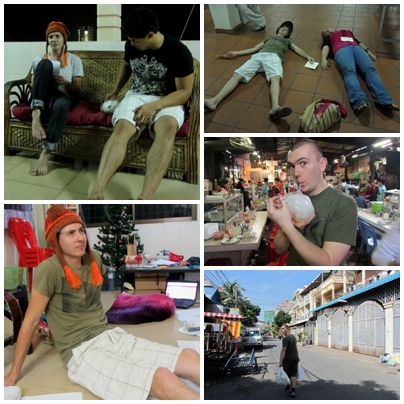 I just got back from my 6th trip to Cambodia in the past 4 years. This one was in honour of the 2nd annual EPIC conference for TCKs. I brought four China expats with me this time – two students from my youth group here, another who moved to a different city in China this summer, and an intern from BICF (the big international church in Beijing). It was kinda strange and wonderful to travel WITH people! I almost never do that. It snowed the night before we were to fly out which was worrying; we met at the airport at 6:30am, moved glowsticks around luggage, and (after running into people I’d had Christmas with!) 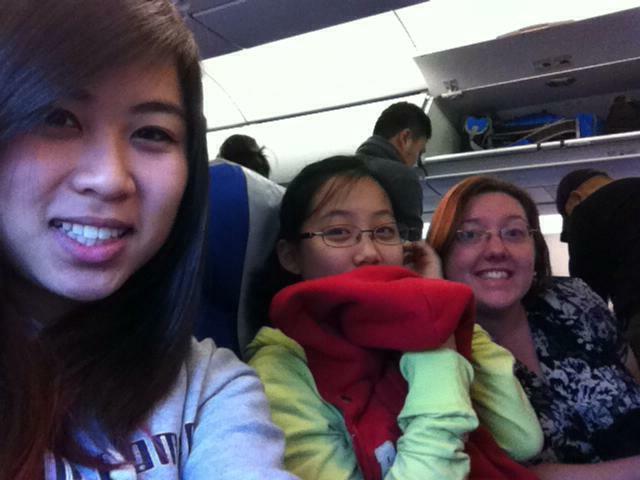 were smoothly on the the plane and took off on time. There was mild-medium turbulence for most of the flight, which ended in us landing 30 minutes late. This was a problem, because in Beijing they hadn’t allowed us to check through all the way to Phnom Penh – we would have to claim our bags and then go out and check in for the second flight. It would be tight, but with nearly two hours between flights it shouldn’t have been a problem. The late flight got rid of our whole margin for error. We stepped off the plane 20 mins before check-in would close for our second flight, and we still hadn’t collected our luggage! At the baggage claim I collected passports and went to find check in (which wasn’t easy!) and arrived at the desk maybe a minute after check-in was due to close. The lady at the desk was helpful, promptly printing out all 5 boarding passes, and I was quickly joined by another lady doing the same thing (her husband was waiting for their bags while she came to check in). The staff warned us our bags might not make it with us today, but they would do what they could. Our first four bags made it up, and were checked in, but mine took its sweet time. Finally it came up, was checked in and – of course – the scanners beeped and I was made to take out and display my bags of nail polish. Then, we were off and racing! We had 15 minutes before boarding would close on our flight and we RAN! We scribbled departure cards while skipping the queues. I was the last one through immigration, making sure the others got through fine, but then I was the one who had a problem! It was the first time I’d travelled outside China on my new passport and the guy was confused by the lack of an entry stamp into China. I was starting to think they wouldn’t let me through when his supervisor came over – and said hey, no problem, just send her through. A security guy came to usher me to the front of the security screening line. The others were just finishing and I told them just to run for the gate and hold the flight for me! We ended up in a line spread out through the terminal, all running for the gate. It didn’t help that all the way along, Chinese airport staff were looking at our flight time and telling us we’d never make it. BUT we did! As soon as I jumped on the bus the doors closed and we rolled off toward the plane. We even got to see our luggage being loaded – on a cart that pulled up late. Whew! At the airport the girls were met by their homestay family – a family one of the girls had known and gone to school with in Texas years ago. The boys and I were met by Christina (youth pastor in Phnom Penh) and Nathaniel (a youth leader from Australia who flew in earlier that day, also for the conference). Our first meal was Chinese food :) The boys went off to their homestay and the rest of us worked on some conference stuff before bed. The next day was Sunday, and we split up between the two big international churches that Christina works for, and at each service the conference was mentioned and prayed for. We met up for lunch with all the conference leaders, and talked through the schedule, what to expect, child protection policy, and all that good stuff. The China team managed to get 15 minutes on the roof (in the Cambodian heat!) to catch up and pray together before we all headed to the afternoon service at ICF. That meant the boys went to the same church twice in one day, but they seemed to enjoy it nonetheless. After church we joined a bunch of Phnom Penh TCKs hanging out on the roof, then all the “imports” went to dinner at a Khmer restaurant with Christina and Chris (the assistant youth pastor). We split up again to take the Beijing team to their homestays for the evening, with some errands and other conference work being done til past midnight. Monday was travel day for 7 conference staff, including me and the two Beijing boys. We spent the morning running last minute errands (and I got to introduce Isaac to Toul Tom Pong market and the fresh orange juice), but then the van we booked didn’t arrive! After some phone calls and apologies from the bus company, we packed up the van near to bursting and were on our way only 2-3 hours later than planned. Travelling from Phnom Penh to Siem Reap in a van. Siem Reap is a good 6 hour’ drive from Phnom Penh, mostly on small two lane roads, through rice paddies, small villages with wooden houses on stilts, and (of course) lots of palm trees, haystacks, and skinny cows. 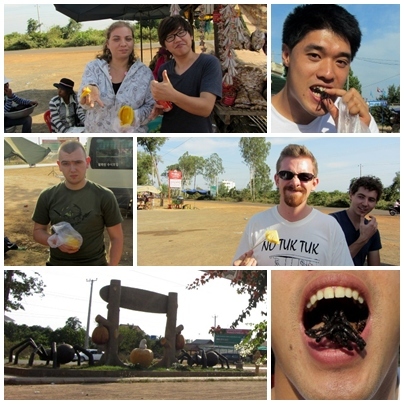 We stopped briefly along the way at the Tarantula stands, where Nathaniel did actually try some of the fried tarantulas and other assorted bugs. The rest of us stuck to pineapple and green mango with chili salt. There were games of ABCD, an attempt at Monopoly Deal, and lots of calls/texts between us and conference staff in both Phnom Penh and Siem Reap, making and confirming plans. We arrived in Siem Reap 6.5 hours after leaving Phnom Penh, the streets full of New Year’s Eve tourists milling about in the dark. We checked into our guesthouse and quickly headed out. I had planned to meet with a family from Beijing who were there on holiday but given it was an hour past the time we’d planned to meet, I wasn’t sure they’d be there. But they were! They had just finished their meal, so I went with them in their tuktuks and we played cards for an hour and a half – so much fun! The trip back to the guesthouse was slow, with the streets choked with new year’s revellers, barely more than an hour before midnight. On Tuesday we prepared for the conference, while the Phnom Penh students travelled down to Siem Reap (the Beijing girls with them). In the morning we sat in a hotel room preparing lanyards and nametags, and lots of game supplies. We visited the two locations where students would be housed and made preparations, and a few people visited the minigolf location to plan for the glowstick golf the following night. At one location we did a bunch of cleaning and arranging furniture (something we didn’t realise would be necessary, and were so glad for the China boys’ help in doing!) In short, it was a full day of preparations. Wednesday dawned all too soon, and with it, the start of EPIC 2013… more on that in part 2!